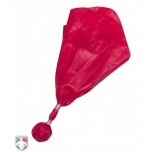 Great item for working Little League games - the usage of this has been well received at our league - My only suggestion would be reducing the size of the weighted center. Amazing flag, great weight, throws well and very well made. I received this flag five days before the expected shipping date which was amazing. Obviously I won't use this during a game since I'm not a NFL coach but it's a great novelty item very much worth the money. The quality of the flag is excellent. The weight in the center of the flag is WAY too big and makes the flag seem 'clunky'. The weight measures 3" x 3" x 1/2". My older flags, the weight measure 1" x 2" x 1/3" which seems to be the perfect size (IMO). If the weight was 1/3 the size I would give this 5 stars.